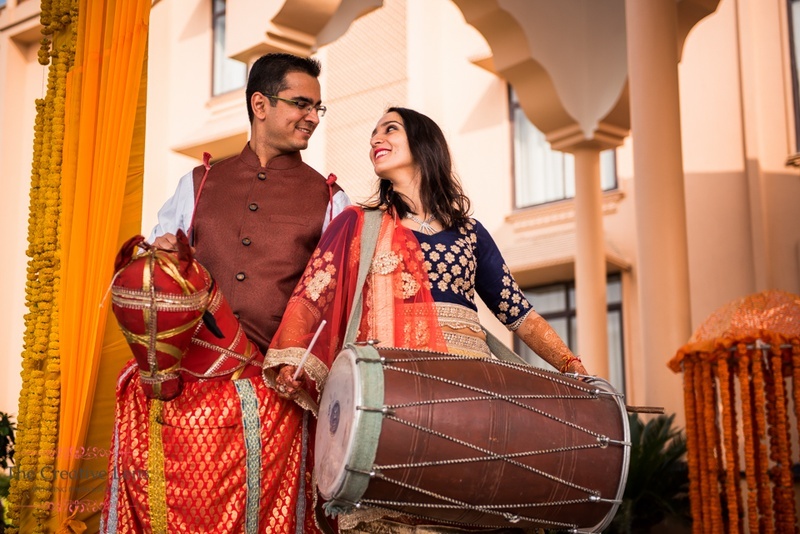 This vibrant Jaipur wedding at Gold Palace, Rajasthan kick-started with a lovely pre-wedding shoot with fun Desi props and traditional outfits. The Mehndi ceremony that followed was rather colourful. And not just visually. The wedding itself was no less lively, with our couple looking extremely happy and in love while everyone around them rejoiced in the festivities. The highlight of the event was the splendid wedding décor. The venue was covered in vibrant drapes, strings of marigold, floral installations and upturned Rajasthani umbrellas. Look out for how creatively the couple chose to disguise their wedding photo booth as a painted, desi-style scooter! The pre-wedding shoot had Ankita in a pretty peach lehenga paired with a deep blue blouse with gold details. Shreyas opted for a casual look, wearing jeans and white shirt under a brown Nehru jacket. They posed with colourful desi props that added a quirky theme to the shoot. Ankita was captured beautifully by The Creative Lens twirling, laughing and simply enjoying the presence of her groom, while Shreyas looked no less pleased with his beautiful bride. What proceeded was a fun-filled Mehndi ceremony where she wore a bright pink and orange net anarkali and her better half balanced out the equation in a simple white outfit with a pastel orange Nehru-jacket. The venue was beautifully decorated in creatively used marigold flowers, colourful drapes that hung gracefully, a floral-decorated cycle with an innovative backdrop that could double up as a photo booth in addition to a number of other engaging props. The Sangeet that took place at the same venue was a splendid affair. The couple graced the event in a decorated carriage, with sparklers going off on their arrival. Our bride-to-be looked stunning in an orange-red lehenga-saree with gold work while the groom looked no less dapper, complimenting her choice warm tones with a midnight blue, velvet bandhgala. The wedding was just as extravagant and filled with colour as all the other events. The groom made his royal entry on a horse, wearing a gold sherwani and Ankita joined him at the mandap in a stunning multi-colour, heavily embroidered lehenga of varying shades of pink, orange and green. What we loved was creative wedding décor. Each and every aspect was decorated beautifully in floral lanterns, birdcages and other whimsical installations.